Pelican is one of the largest birds in the world. They can be found on every continent except for Antarctica. They prefer warmer areas so they live in temperate and tropical areas and avoid cold areas. There are a total of eight different species of these birds. Their scientific name is “Pelecanus”. They have long bills that are hooked at the tip. They are best known for large pouches of skin hanging down from their bills. These pouches are used to scoop up fish from the water. These throat pouches are also known as “gular pouch” or “gular sac”. The earliest pelican fossil on record is a 30-million-year-old skull. It was found in the Oligocene deposits of France. These birds are mouth-breathers as their nostrils are sealed off, buried under the beak’s horny sheath. Female pelicans lay 1 to 3 eggs and their incubation period lasts between 28 and 36 days. Their average lifespan in the wild ranges from 10 to 30 years depending on the species. The wingspan of a pelican can be more than six and a half feet long. They can comfortably hold up to three gallons of water in their throat sac. They are excellent fliers and can soar like eagles with their giant wings. Dalmatian Pelicans are the largest, having a wingspan of approximately 12 feet. The Great White Pelican is the heaviest species weighing from somewhere from 9 to 15 kilograms. These birds are social creatures and typically travel in groups called “flocks”, often strung out in a line. Declan, Tobin. " Pelican Fun Facts for Kids ." Easy Science for Kids, Apr 2019. Web. 26 Apr 2019. 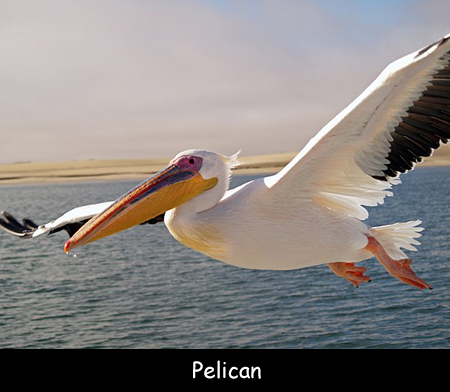 < https://easyscienceforkids.com/pelican-facts/ >.